This is a question most gastro-oesophageal reflux disease sufferers struggle upon. Promoting healthy nutrition that is based on avoiding certain foods while increasing the intake of others has the potential to confer significant long-term health benefits among acid reflux sufferers. Lifestyle and dietary alterations are considered to be an integral and inseparable part of any long-term holistic GERD treatment. The foods we consume play an important role when it comes to keeping our body's delicate natural inner balance. Since certain foods and dietary habits have been found to directly or indirectly promote aggravation of acid reflux, avoiding those foods and adopting specific dietary habits for optimal digestion could have a tremendously positive effect on your existing medical condition. For this, you should first know which foods to avoid for treating acid reflux. · Coffee and other caffeine containing beverages lead to increased acidity, so avoid large quantities of coffee. Try to limit your daily coffee consumption to two cups or less. If possible, split your coffee cup into two half-cups and reduce coffee drinking before the bedtime. · Alcohol can irritate the stomach and relax the LES muscle, leading to increased acidity and reflux. Abstain from alcohol. · High-fat foods are among the biggest culprits behind GERD symptoms. They take longer to digest and are not easily eliminated out of body, thus increasing the chances that acid will splash up into your oesophagus. The only exceptions are omega-3 fatty acids from fish and fish oil, which are in fact powerful anti-inflammatory agents. · Chocolate contains a great deal of caffeine and fat. This may increase acidity and worsen digestion and hence should be avoided. If you are a devoted chocolate enthusiast, go for dark, organic varieties, and eat no more then two to three tiny squares two to three times per week. · Milk and milk-based products that contain a big proportion of calcium should also be avoided before bedtime. · Peppermint, spearmint and other mints can worsen acid reflux symptoms. Avoid foods that contain strong mints, including mint-based herbal teas. · Acid forming foods, for instance: tomatoes, citrus fruits, and meat products should be avoided. · It is best to avoid glutinous cereals such as wheat and white rice. Go instead for brown rice, oats, bran and pretzels! With these dietary changes and a healthy motivation to alter your lifestyle, you can be on your way to overcoming gastro-oesophageal reflux disease and improving the quality of your life and well-being. Whatever your medical condition is, when you finally decide to improve your quality of life, you can literally choose to cure GERD and prevent its recurrence. By adopting the holistic approach, you will have the power to make it happen. Holistic approach tackles all the causes that effect acid reflux and is perfectly safe as it comes with no side effects. 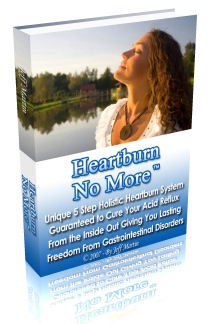 If acid reflux is your worry, then holistic treatment is the best way out.